Twenty-six rounds per minute, Multiple Rounds Simultaneous Impact, full armour protection, shoot-and-scoot. Are we talking about the Paladin, PzH2000 or another artillery system of the 21st century? No! We are talking about a mortar system, plain good old mortars. Not just any old mortar but the newest system to come out of Finland, the Advanced MOrtar System or AMOS for short. Close fire-support will be very important on future battlefields, as it has always been. The infantry’s own ‘artillery’ consists of 81mm or 120mm barrel loading mortars. In most cases, these are towed weapons and need time to set up. The crew is very vulnerable at that point as they are out in the open. Attempts to give the crew and weapon some protection only had limited success. The open-topped M106 versions of the M113 gave the mortars mobility. Still the large open hatches necessary for barrel loading made the crew stand out in the open. Several attempts in the 1990’s gave the reliable mortar real armour protection. The mortar-under-armour (MUA) was born. The Saudi National Guard chose a single barrel 120mm system, but western armies do not seem to be interested. Finland has broken that reluctance by introducing the revolutionary AMOS. The weapon system is designed and built by Alvis Hägglunds of Sweden, while the Finnish company Patria makes the turret. The joint company of Patria Hägglunds Oy does the marketing of the system. 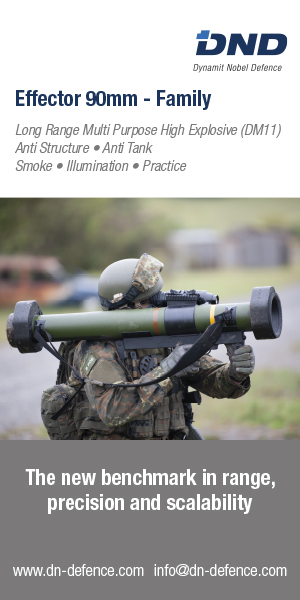 The short-listing of the AMOS for the US Army Future Combat System mortar makes a closer look at the system worthwhile. The fully armoured turret has the same protection as the vehicles on which it is mounted. All combat vehicles that can have a turret ring of 2.3 meters are capable of carrying the AMOS system. The weaponry itself consists of two 120mm smoothbore mortar tubes mounted side-by-side in the turret. It can fire all kinds of existing 120mm smoothbore ammunition, including assisted rounds and the future Precision Guided Mortar Munitions. The automatic loader holds thirty rounds in the turret. Another fourteen special rounds are stored besides it. The hull storage depends on the vehicle and of course the customers’ wishes. The weapons have an elevation of -3 unto +85 degrees. The complete weapons system, laying system, ammunition stowage, and fire control, navigation and communication systems are fitted inside the turret. All the carrying vehicle has to provide is hydraulics and a pneumatics connector, keeping modifications to the original vehicle an absolute minimum. The Finnish army mounts the AMOS on another local product, the Patria XA-203 6×6 APC. The system has also been tested on the Hägglund CV90 tracked combat vehicle. It has shown that it does not matter what vehicle is used, the system will perform equally well. The AMOS is fitted with state of the art navigation and targeting systems. The ballistic computer will make all necessary computations for the fire-mission. The tubes are then laid on target using that data and within seconds, rounds are on their way to the target area. Using two 3000mm long tubes fitted with an automatic loader gives this weapon an impressive rate of fire of 26 rounds per minute using ammunition from the turret stowage. When loaded from the hull storage the system will still fire 16 round per minute. When on the move the AMOS can start firing within thirty seconds from stopping, letting of the first four rounds in less then eight seconds. The vehicle then drives of immediately after the rounds are fired (shoot and scoot). Even though the risk of counter battery fire on the position is real, the crew is safe as they are already on the move to a new position. Using the automation build into the AMOS the concept of Multiple Rounds Simultaneous Impact (MRSI) is available. With this system, one vehicle can put 14 rounds on a target within several seconds, making it sound and feel like a huge barrage. The first rounds are fired almost vertical and will take 75 seconds to the target. The tubes are then lowered and more rounds are fired at smaller angles and charges and therefore shorter flight times with the last two taking only 15 seconds. Even before the rounds detonate, the vehicle is already driving away from the firing position. Another possibility is the direct fire mode where the tubes are horizontal and fired at a target. The mortar rounds have no armour piercing capability but against hard targets, it can be devastating. It can be used in a similar way the M928 CEV’s 165mm gun was used by the engineers. Choosing the family of vehicles very carefully, so that it can carry more than just infantry and automatic weapons will pay off. The AMOS however, can be fitted to almost all vehicles chosen by today’s armies, including the Stryker. One turret was even tested on the Swedish Combat Boat 90 and fired successfully at targets on shore. It will be tested on the new Swedish combat boat under development. Certainly, it will have the edge over the now open topped version coming into service soon. The added weight of the turret (4.4 tons) will bring the combat weight of the Stryker to 16.5 tons. The only drawback is that the Stryker/AMOS cannot be transported in a C-130. However, two can be flown-in by C-17 and three by C-5 according to the manufacturer. Artillery on demand and instantaneous response will give commanders the edge over their opponents. But why wait for the FCS to enter service, while you can get the system now, use it on the existing fleet of vehicles and simply transfer the AMOS system to the new vehicles when they arrive. Next article 'Fysieke Distributie', zoveel als je wilt, maar alleen wanneer nodig!